Sometimes people don’t wind up with the career they were destined for. There’s probably a guy working at a Target in Phoenix who was supposed to be the next Bill Gates, but he or she never got their shot. Bryan Wilson should be directing big-budget comedies in Hollywood. Now, before anyone pulls a Facebook freakout and screams, “Why is a law enforcement website promoting a defense attorney who gets bad guys off the hook? 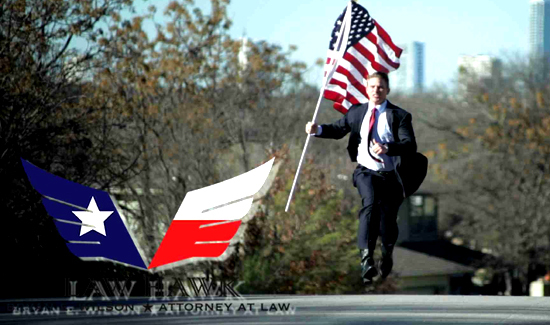 This is an outrage!” keep in mind this is only about the amazing advertisements from the Texas Law Hawk. Just because a guy’s a defense attorney doesn’t mean he can’t also be a comedy genius. Wilson’s previous ad went viral in no time flat—it was just that funny. Sorry !! I don’t find his comedy the least bit funny! I think it’s insulting and disgusting!!! I’ve been a long time APB reader and am shocked to see this aired here ! !